Diabetes is a condition in which a person's blood sugar remains too high because the body can not use up all of the glucose that it produces and consumes. Glucose is naturally made in the liver, and it is also a by-product of the digestion of foods high in starch and sugar. Usually insulin, a hormone produced in the pancreas, would help glucose be burned as fuel by the body's cells, but in diabetics this insulin is either absent (Type I diabetes), too little to cope with the amount of glucose in the blood (Type II diabetes) or does not work properly (Type II diabetes). Currently there are over 2 million Britons living with diabetes. Excessive need to urinate, particularly at night. Weight loss, even if appetite remains the same or increases. An increased healing time for cuts, scratches and scrapes. Cramps or constipation (more common for Type II diabetes). Diabetes can be diagnosed relatively easily by two simple tests. 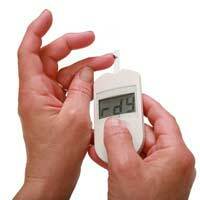 The first test measures glucose in the urine. If an excessive amount of glucose is found in the urine, a blood test will then be performed in order to measure the amount of glucose in the blood. There is no cure for diabetes, but there are effective treatments available for both types. Those with Type I diabetes are often called insulin dependent diabetics because they must administer synthetic insulin to themselves, usually by daily injections or via an insulin pump. Type II diabetes can be more readily controlled with a change of diet, though some medication may be prescribed if results are not obtained to a satisfactory standard. Though there is no cure for diabetes, there are treatments available which allow all diabetics to lead happy, full lives. In addition to any treatments recommended by your GP, anyone with or worried about diabetes should take care to eat a healthy, balanced diet, take plenty of regular exercise and get enough rest every night. Cutting out smoking, drinking to excess and doing drugs are also essential to good health. With just a few changes to their daily routines, those with diabetes can continue on with life as normal.